The Queens Hotel, Lerwick, Shetland Islands. The Queens Hotel, Lerwick, and Lodberries in the Shetland Simmer Dim. The Queens Hotel, Lerwick, from the Victoria Pier. The Queens Hotel, Lerwick, and Lodberries from the breakwater. Public Bar at The Queens Hotel, Lerwick. The Queens Hotel has been in existence since the early 1860s and has seen a number of transformations since it began life as three traditional, stone built, Victorian era lodberries bringing it up to a comfortable 3 Star/4 Crown Hotel standard. 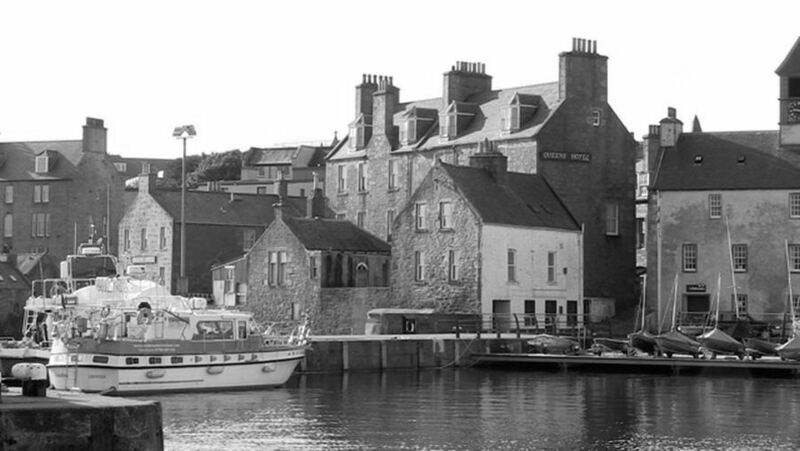 Located in Lerwick's conservation area at the south end of Commercial Street, very close to the town centre and all it's amenities, it stands directly in Lerwick Harbour and, as nearly all the rooms on our 2nd and top floors overlook the harbour and the island of Bressay, makes it an ideal shore base for visiting yachtsmen and their crews. Catering equally for guests who just want a few nights bed and breakfast through to a longer term holiday base the Queens Hotel, which despite being more than 150 years old, offers well appointed, centrally located, quality and comfortable 3 Star accommodation to suit all needs. All our rooms are "en-suite" and our accomodation comprises of 8 Single bedrooms, 6 Double bedrooms, 12 Twin bedrooms and 1 Triple bedroom making it ideally suited to single travellers, couples, family groups and coach parties. All rooms include a writing desk, wardrobe, bedside cabinet(s), television, trouser press, telephone, kettle, hair drier, soap and shampoo, bottled water, biscuits, tea and coffee, milk and sugar whilst Cot beds for young children are available on request. Most of our rooms offer a view over Lerwick Harbour. If you would like one of these rooms, please advise our reception staff when booking. Facilities include a Breakfast Room/Restaurant, Public Cafe Bar and Games Room whilst FREE Dual Band WiFi from multiple access points is available is throughout the hotel. Our Restaurant caters for both Guests and Visitors and serves Breakfast from 07:30am to 09:00am, Lunch from 12:00pm to 2pm and dinner from 6:00pm until 9pm. Sample Menus are available here or, you may contact our reception desk who will be able to advise you of the fare on offer each day. For you to enjoy Shetland cuisine at its best a skilful team of chefs can select from a range of fresh local produce. Choose Shetland Salmon, Shetland Seafood or Shetland Lamb all accompanied by Shetland grown vegetables. The Public Cafe Bar at the Queens hotel is open to both Guests and members of the general public and it should be noted that, although our licence prohibits the sale of alcohol before 11am, in addition to a good selection of beers, wines and spirits (including a huge selection of Malt Whisky's), a wide variety of tea's, coffee's sandwiches. snacks and biscuits are available in the cafe bar area. Additionally, meals may also be taken in our Cafe Bar area during the Restaurant's opening times. We welcome guests and visitors of all ages and abilities and, whilst our staff will assist in any way they can, we have to advise that due to the age and design of the building, wheelchair access to The Queens Hotel is limited to parts of the ground floor only. Those with other mobility issues should be aware that we also have a number of internal staircases and, again due to building design and other issues, it has not been possible for us to install lifts. Whilst we do not have our own car park, guests and visitors should note that there are plenty of FREE car parking spaces available nearby. The Queens Hotel has a reputation for offering outstanding value and a unique experience. Whenever you think of a break, just Book a Room at the Queens Hotel or contact our friendly reservation staff who can offer special discounted Direct Booking Room Rates that are NOT available to those who book via on-line booking sites.